This is the first time I've participated in the VSN Challenges. The theme is "Cloud 9". VSN Mini #1: Make a card inspired by one of the 3 papers given to go by; add something sparkly. I used the sample that had autumn colors. I distressed the edges of the patterned paper some but it's hard to see. The blue stripe is sparkly. I also raised the sentiment piece before placing it on the Chocolate Chip larger piece. VSN Mini #2: Use grays with the spotlight technique. I used the Inspired By Nature stamp. I know this may sound "off" but I really like how some solid images come out a little blotchy. This is one of those stamps. It gives it a "thoughtful" look to me. The Basic Gray larger piece on the base black card is stamped with the Linen stamp in black Memento. After I submitted it I added a scrap piece of tiny black satin ribbon on the Hodgepodge Hardware. 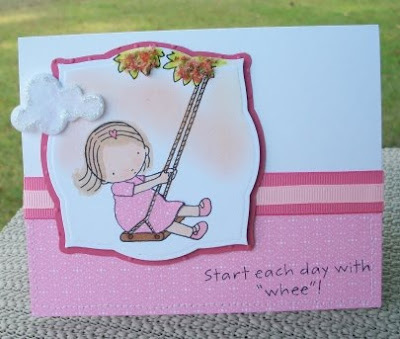 VSN Mini #3: Use pastels or chalks; solft colors and for an additional challenge, use Flower Soft. This card turned out to be my favorite!! I love the Pure Innocence stamps (they are so easy to paper piece) and the Cloud Die from PTI. The image was stamped on PTI white with Memento Tuxedo Black. The sky was sponged with Stampin Pastels (Barely Banana and Pretty in Pink). It gave it a kind of warm glow. I paper pieced her little dress with PIP Prints Pack and colored her with Copics. I love how her little hair "kicks" out. This piece was cut with the Labels 3 Nesties. A piece of Rose Red was used to layer but the next size was too big. This was run through the Cuttlebug with the Swiss Dots EF (my fave). So I used the same Nestie die and traced around the outside onto the Rose Red piece and cut it out. It was perfectly sized! A piece of white felt was die cut with PTI's smallest cloud die and Stardust Stickles were traced around the outside for a little sparkle. A little Summer Mix Flower Soft was put on the tree leaves. The image piece was foam taped and put on top of the Rose Red layer then adhered with double sided tape. The same PIP printed paper was used at the bottom of the card and sewn. Small PIP Grosgrain was placed over a larger piece of Rose Red Grosgrain and put at the top of the sewn piece. The accompanying sentiment was stamped in Memento Black at the bottom of the card. The last one I did (never got to the fifth one...so sorry!) I used inspiration of a lone snowflake with sparkle. The base is Bashful Blue. White cardstock was embossed with the Dotted Swiss EF. Using Martha Stewart's snowflake punch, I punched out 5 snowflakes. Four were randomly placed on the white piece. A strip of Martha Stewart light blue self-adhesive stitched ribbon was used as a divider in order to break the white. 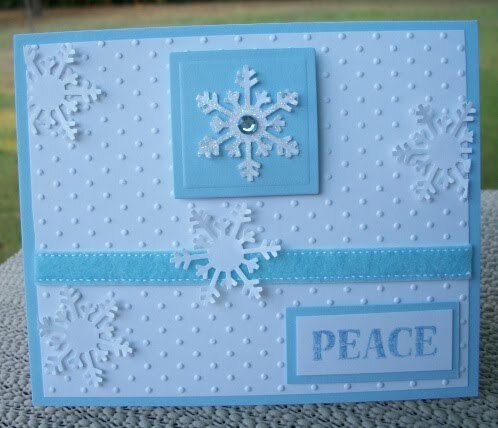 Then I stamped "Peace", thinking about angels and how quiet they were in Bashful Blue and placed on a scrap piece of BB. Then the main image was a snowflake that had been run through my Xyron 150 upside down and placed in SU Dazzling Diamonds Glitter. A square was cut and embossed and the sparkly snowflake was placed on it. Then a light blue Kaiser Rhinestone was put in the center. Thought this one looked "cool"...pardon the pun! Thank you for looking at my submissions! Oh my goodness you have been busy.. These are terrific.. I remember when VSN was huge on SCS... Everyone would participate.. Love what you did here.. Have a great weekend.